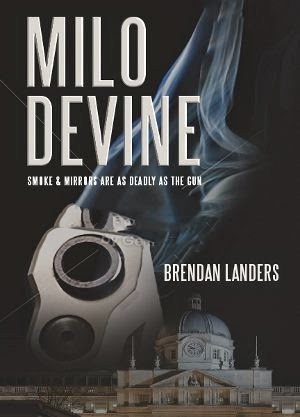 The eponymous Milo Devine in Brendan Landers's first novel in 2001 is a former garda turned private eye. His latest case is to find the beautiful but wilful daughter of a politician. He does, but she's dead and he's chief suspect. Landers was born in Dublin and grew up in Raheny. His first job was in the mail room of Irish Shipping. He also worked as a baker and factory worker in London and on returning to Dublin became a bus conductor. In 1984 he emigrated to Toronto and studied journalism, returning to Ireland in 2000 ("a terrible mistake"). As a journalist and short story writer his work has been published in a wide range of Irish and North American publications. Milo Devine was republished on Kindle in January 2015. Read sample chapters.